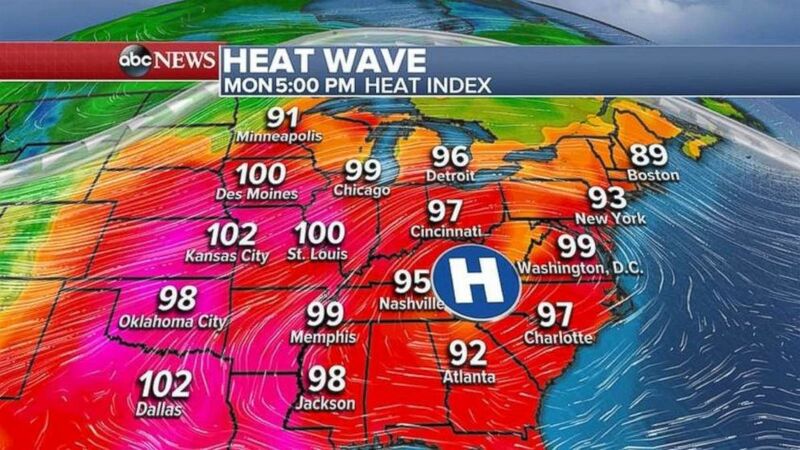 A heat wave is moving in from Chicago to New York City over the next several days. Already Chicago Executive Airport tied a record high of 93 degrees on Sunday and with humidity it felt like it was 106 degrees in spots. Fifteen states from Arkansas to Maine are under heat advisories or warnings. Temperatures will be in the 90s and with humidity it will feel like over 100 degrees in many areas around eastern United States. 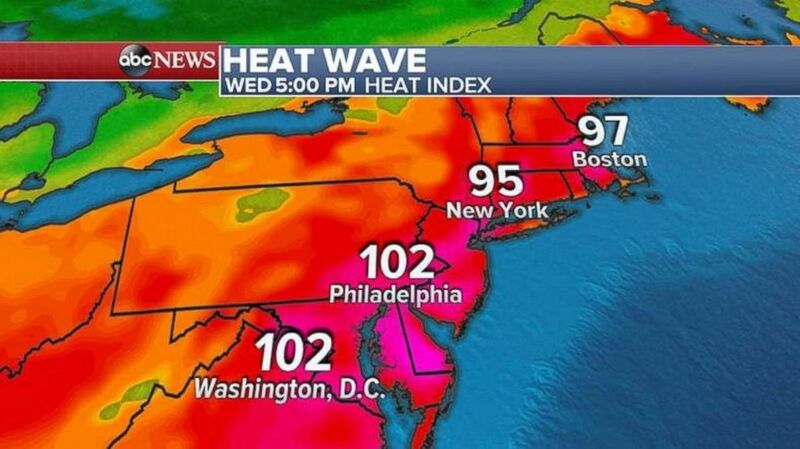 A heat wave will cover the eastern U.S. for the first three days of the work week. The worst of the hot and humid weather will move into the Northeast by Wednesday when an excessive heat watch has been issued for Hartford, Connecticut, and Boston -- where heat indices could be 100 to 105. The heat index will be over 100 degrees in Washington and Philadelphia, and the mid to upper 90s in New York and New England on Wednesday. There were over 100 damaging storm reports from the Plains into the Great Lakes over the weekend, including one tornado in Indiana. As the cold front continues to move east, more severe weather is possible Monday from Iowa to Michigan. The biggest threat will be damaging winds, hail and an isolated tornado. Flash flooding is possible in Wisconsin and parts of Midwest. 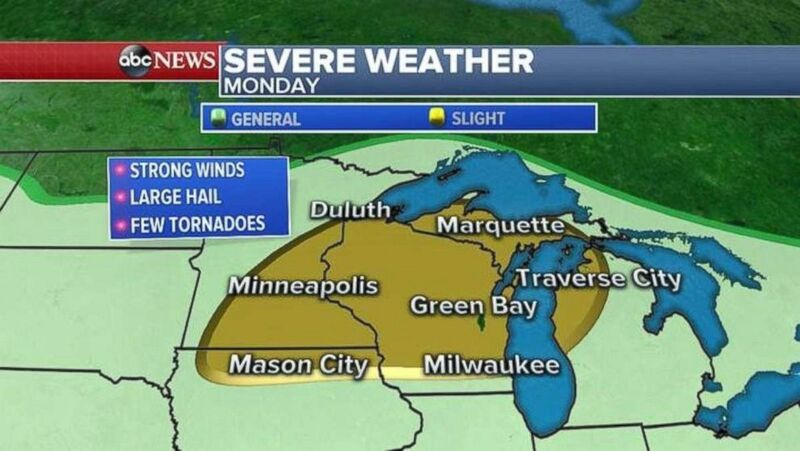 A chance for severe weather exists over much of Wisconsin and the Upper Peninsula of Michigan on Monday. The severe weather threat expands on Tuesday as the cold front slows down and stretches from Kansas to Michigan. Damaging winds will be the biggest threat but some hail is possible, but we can’t rule out a few tornadoes. 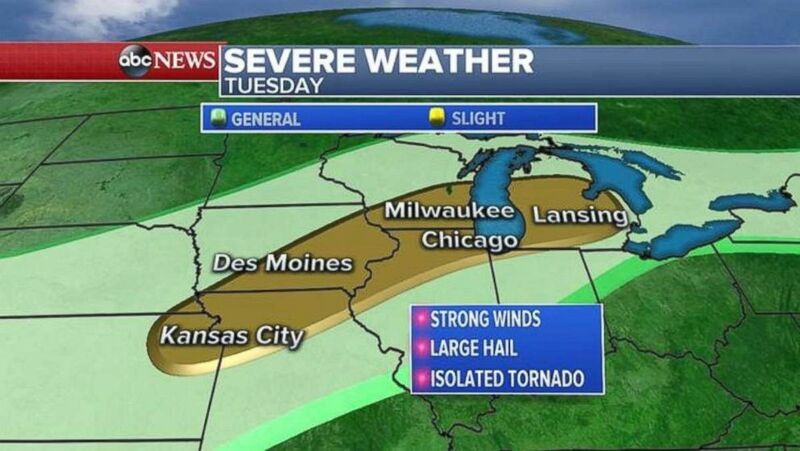 The severe weather threat on Tuesday stretches from Kansas City, Mo., to Lansing, Mich.